Two-thirds of family businesses fold before reaching the second generation, and just 12% make it to the third. Advance planning is the key to a lasting corporate legacy. 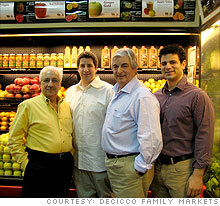 Led by patriarch Frank DeCicco Sr. (far left), the DeCiccos have passed their small chain of grocery stories into the second generation of family managements. How do you handle your credit card charges? Fresh perspectives from outsiders can deflect and diminish intense jockeying for power from within the family. You must separate family and business, Veale says. In your role as an executive, you need to stay focused on business growth and opportunities, not petty grievances. Conflicts in the family easily transfer to the business if not managed well. It's a no-brainer to include kids in the family business from an early age, but some business owners make the mistake of TMI - too much information. Coming home every day with stories of how stressful, painful and horrible the job is isn't going to inspire anyone to march behind you into battle. Says Veale: "When you say, 'You know, there is fun working here,' the kids are listening." It's essential to human nature that you appreciate the things you earn more than those that are given to you. Don't hire family members full-time until they've proven themselves elsewhere. By learning to sink or swim in the real world, they'll come back with new skills and perspectives and get used to being paid what they are worth. Plus, other employees will respect them more for a track record of proven success outside the shelter of the family business. (Fortune Small Business) -- The supermarket chain Frank DeCicco Sr. founded with his two brothers more than 30 years ago is still run by DeCiccos from top to bottom. That's a source of deep pride for the 62-year-old patriarch, and he would like nothing more than to know that all those seven-day workweeks needed to build the business from a Bronx storefront to a thriving six-store chain in New York's Hudson Valley will mean the company stays in the family for generations to come. But he knows that in business, there are no guarantees. "It's not easy," DeCicco said as he sat in a modest office space above the bakery in their New City, N.Y., store, with his son Frank Jr. perched one seat away. Even the best of intentions - and dedication - can falter when business mixes with blood. The Small Business Administration estimates that one-third of family-owned businesses will survive the transition from the first to the second generation. If you manage to clear that hurdle, higher ones lie ahead. The Family Firm Institute says only 12% of family-owned businesses stay viable into the third generation, and only 3% are alive at the fourth-generation level and beyond. "The number-one thing is planning," said University of Cincinnati College of Business Professor Charles Matthews, founder of the UC Center for Entrepreneurship Education & Research. "It really comes down to a plan for succession, rather than just tossing the cards into the air and seeing where they fall. Even an informal plan gives you a great chance to survive the transition to the second and even third generation." Craig Kurz now runs HoneyBaked Ham Co., the company his grandfather, Harry J. Hoenselaar, started in 1957 when he opened his first store in Detroit with $500 in his pocket and a second mortgage. Kurz credits the family's success - there are more than 400 stores nationwide today - to solid planning and a willingness to change with the times. For his grandfather, success was making enough money for a second house in Florida, he said. But succeeding generations faced a much more complex and challenging business environment - Hoenselaar's patent on the company's famous spiral slicing expired in 1981, forcing the business model to change drastically. "You got a sense of urgency," Kurz said, "and we started talking not as a trademark, but as a brand." An aggressive expansion campaign for the privately held business created 137 new stores and four regional catalog operations, Kurz said. HoneyBaked moved beyond ham into catered lunches, sliced and glazed turkeys, even desserts. And of the third-generation family members who joined the business in the 1980s - they call themselves "G3" - 75% remain in leadership positions today. In a time of economic uncertainty and rapid globalization, keeping a family-owned business in your name for another generation can seem like a quaint goal. However, such firms are major drivers of the U.S. economy. Management Professor Joseph H. Astrachan, a noted expert in the field of family businesses and director of the Cox Family Enterprise Center at Kennesaw State University in Georgia, says using the broadest definition of "family" firms shows that they employ 62% of the U.S. workforce, or approximately 82 million people, based on census data, IRS returns and his own independent research. Because no consensus definition exists of what counts as a family-run company, Astrachan calculates his statistics under multiple models; using the narrowest methodology brings that figure down to 27% of the workforce, or 36 million people. Either way, the economic impact is significant: Even under Astrachan's narrowest model, family firms contribute 29% of the U.S. gross domestic product. For 35-year-old Dan Venditti, contributing to the health of the U.S. economy wasn't exactly the goal when he and his cousin Paul Komanecky took over part of his family's cycling and fitness business in Syracuse, N.Y., Wayne's and Meltzer's Syracuse Bicycle. It was just a given: He had been working on and off for his dad since grade school. But just coming in and taking over the show in his early 20s wasn't going to work. His father had many loyal - and mostly older - employees. "They weren't going to listen to me tell them what to do," Venditti said. So he ran his own shop in nearby Rochester for three years, gaining valuable experience and a stronger sense of his own abilities. He's been back home now for eight years, and the bike shop is booming. His father is still involved, mostly on the fitness end, but Venditti and Komanecky have been able to strengthen the business by developing new markets. Today, you are just as likely to see a serious triathlete in the cousins' shop as a family browsing for that first two-wheeler. Going after the high-end market - a major shift from the previous generation's sales focus - has changed the business substantially. A recreational user might start looking around for a bike in April and disappear by Labor Day. Pros and serious amateurs, however, start earlier and end later, extending the selling season "tenfold," according to Komanecky. In a typical January before going after the higher-end market, the store might have posted $6,000 to $8,000 in sales, Komanecky said. Now that figure is closer to $60,000 to $70,000. Other aspects of the business have also changed with the times. The shop moved into a new facility in 2006, modernized its logo, and expanded its online presence to include a popular e-mail newsletter. 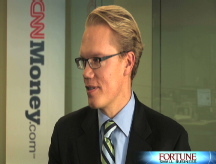 "We get a tremendous amount of feedback on that," Komanecky said. But tellingly, one thing Venditti was happy to scrap was the 90-hour workweeks of his father's day. With a newborn and a pre-schooler at home, he's finding ways to juggle the demands of modern family life and running a business. That's something Frank DeCicco Sr. wishes he'd focused on more in the early years, when he and his brothers concentrated so intensely on growing the business. He's happy to see a new generation try a different formula. Frank Jr., 31, remembers the hectic pace. "Sometimes I fought being here growing up," he said. "But I look back and it's worth it. He'll likely have a chance to invent a new father-son business relationship for himself. Competing for Frank Jr.'s attention these days is a new baby boy. His name? Do you own a family business? Tell us about it. Should I split the family business?